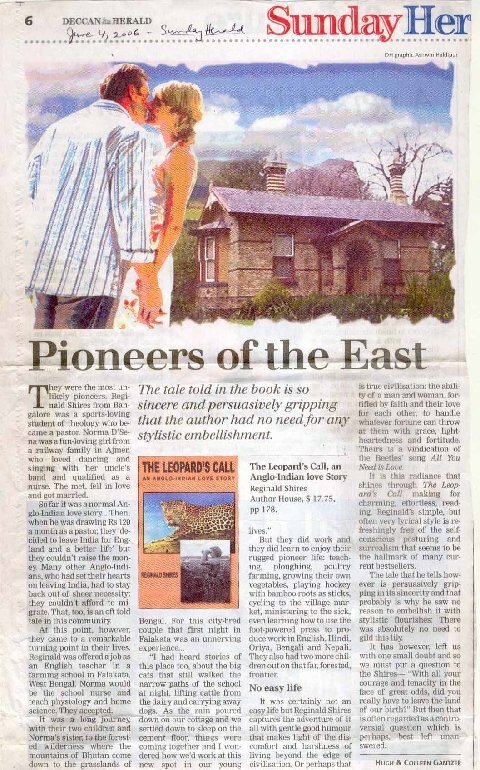 The Leopard's Call: An Anglo-Indian Love Story, is a gripping account of a young husband and wife team. Norma and Reginald Shires, a nurse and minister, just two years into their marriage, set out to live in the wilderness grasslands of West Bengal, India, down from Bhutan. There they began teaching and building up a high school for students from rare tribal groups. From the very first page of this eloquent brief on living a simple life and raising a family in a jungle area, you become engrossed in a hilarious yet moving true story of their unforgettable world. Anglo-Indians have often distinguished themselves in sports, entertainment, medicine, education, the railway and telegraphs and in the armed services. This story is an example of those who devote their lives to those in need. The tale told in the book is so sincere and persuasively gripping that the author had no need for any stylistic embellishment. Reginald Shires Author House, $ 17.75, pp 178. They were the most unlikely pioneers. Reginald Shires from Bangalore was a sports-loving student of theology who became a pastor. Norma D’Sena was a fun-loving girl from a railway family in Ajmer, who loved dancing and singing with her uncle’s band and qualified as a nurse. The met, fell in love and got married. So far it was a normal Anglo-Indian love story... Then, when he was drawing Rs 120 a month as a pastor, they ‘decided to leave India for England and a better life’ but they couldn’t raise the money. Many other Anglo-Indians, who had set their hearts on leaving India, had to stay back out of sheer necessity: they couldn’t afford to migrate. That, too, is an oft told tale in this community. At this point, however, they came to a remarkable turning point in their lives. Reginald was offered a job as an English teacher in a farming school in Falakata, West Bengal. Norma would be the school nurse and teach physiology and home science. They accepted. But they did work and they did learn to enjoy their rugged pioneer life: teaching, ploughing, poultry farming, growing their own vegetables, playing hockey with bamboo roots as sticks, cycling to the village market, ministering to the sick, even learning how to use the foot-powered press to produce work in English, Hindi, Oriya, Bengali and Nepali. They also had two more children out on that far, forested, frontier. It was certainly not an easy life but Reginald Shires captures the adventure of it all with gentle good humour that makes light of the discomfort and harshness of living beyond the edge of civilisation. Or perhaps that is true civilisation: the ability of a man and woman, fortified by faith and their love for each other, to handle whatever fortune can throw at them with grace, light-heartedness and fortitude. Theirs is a vindication of the Beetles’ song All You Need is Love. It is this radiance that shines through The Leopard’s Call making for charming, effortless, reading. Reginald’s simple, but often very lyrical style is refreshingly free of the self-conscious posturing and surrealism that seems to be the hallmark of many current bestsellers. The tale that he tells however is persuasively gripping in its sincerity and that probably is why he saw no reason to embellish it with stylistic flourishes: There was absolutely no need to gild this lily. It has however, left us with one small doubt and so we must put a question to the Shires— “With all your courage and tenacity in the face of great odds, did you really have to leave the land of our birth?” But then that is often regarded as a controversial question which is perhaps, best left unanswered. At the Age for Love--A novel of Bangalore during World War II , is an extraordinary story of a soldier''s family waiting for his safe return from the Africa Front where he serves with a British tank unit pressing hard against the Germans in the desert of Libya. The chronicle begins with the soldier, Capt. Edward Thompson, saying goodbye to his wife Amelia and son Paddy and ends with his return at the end of the war. The story, narrated in incredible detail, tells how the boy and his mother with their relatives and friends live in this hectic military city in South India, where those who stay behind are swept along into the rushing, wild stream of British history in India during a time of war. The lives of these women--and their children--provide a bold story of Anglo-India in this multihued Indian landscape where rogues and villains and the honest, hard-working, church-going, form relationships in this saga as men and women cross family and racial boundaries in their search for love. The city of Bangalore with its cluster of towns around British army barracks comes alive with memorable characters and this novel follows their tense and gripping relationships. The ending, where these fun-loving characters come together in a frail boat on the peaceful Cauvery River at Seringapatnam near sunset, has much to say about life and the human mystery and the vision it offers us as we live in a changing world. Reginald N. Shires, a clergyman, was born in Bangalore, the capital of Karnataka state in South India. He studied at Clarence High School in Bangalore and went to Spicer College near Pune. He completed his graduate studies in journalism at Pennsylvania State University in the U.S.A. He also studied theology at the seminary at Andrews University, Berrien Springs, Michigan. He is the author of The Leopard''s Call: An Anglo-Indian Love Story , a non-fiction book of family life at Falakata, a small town on the grasslands of Jalpaiguri District, West Bengal, India. His fiction, "The Day Ernie-Boy Retired," a story of one day in the life of a working man in Bangalore, appears in Voices on the Verandah . He lives with his wife Norma D''Sena Shires in Maryland in the U.S.A., just a few miles from Washington, D.C., the nation''s capital.